DO sit down to eat at busy food stalls, not deserted one: the food will probably be better there and the atmosphere certainly will be! DO go during local meal times (around 11h30 – 13h00 for lunch, no later than 20h00 for dinner):there are not many refrigerators on the street and Vietnam is a tropical country, so if you prefer fresh food, eat early! DON’T wait to be served: looking at what others are eating and point out something that looks tasty or have a peek in to the cooking pots and choose from there. DON’T forget to give your bowl and chopsticks a good wipe with the paper napkins provided, like everyone else around you: a Vietnamese doctor friend declares it probable affords little or no protection from possible contamination but it is essential for the street credibility. DON’T panic about hygiene – if you choose sensibly, your meal will not only be very cheap but also very delicious. Safest of all are the vast array of filling soups and rice gruels. 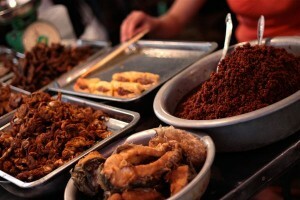 Deep-fried or boiled meat and vegetables are also a good bet. DO use your judgment: for example, ice is usually made from the purified water but if you are outside the bigger towns or it’s the rainy season, better not risk it. If you have a delicate stomach, avoid herbs and raw vegetable and eat only fruit that has been peeled. In fact, this latest point applies anywhere if you are worried about consuming pesticide, as they are showered over fruit in terrifying and uncontrolled quantities in Vietnam. DO drink bia hoi. It is a safe, local choice and will help ease down almost anything. DON’T stare at the pavement under your table, it might spoil your appetite, as this is the natural repository for any garbage or inedible bits left by previous customers. DO go back if you like it. It cam only get better as the next time you will be greeted with smiles, friendlier service and choicer morsels!